Chicken potstickers would have previously been filed under "too intimidating to attempt", but then I took a cooking class one Tuesday night at my local Shoprite where I then discovered not only how easy they actually were, but how completely, utterly, delicious as well. After the class, since I was you know, already in the grocery store, I bought all the ingredients so that I could have more, as soon as possible. Normally ground chicken is not something I'd buy, though perhaps this recipe has not only opened my eyes to the world of potstickers, but also to ground chicken? Mixing up the insides to these is quite simple, the labor comes in carefully tucking the filling inside the wonton wrappers. I looked up a few videos on how to get all fancy on YouTube, but of course a single fold will do the trick. I'd recommend getting an extra set of hands to get all these done so that you can get to the eating part faster. 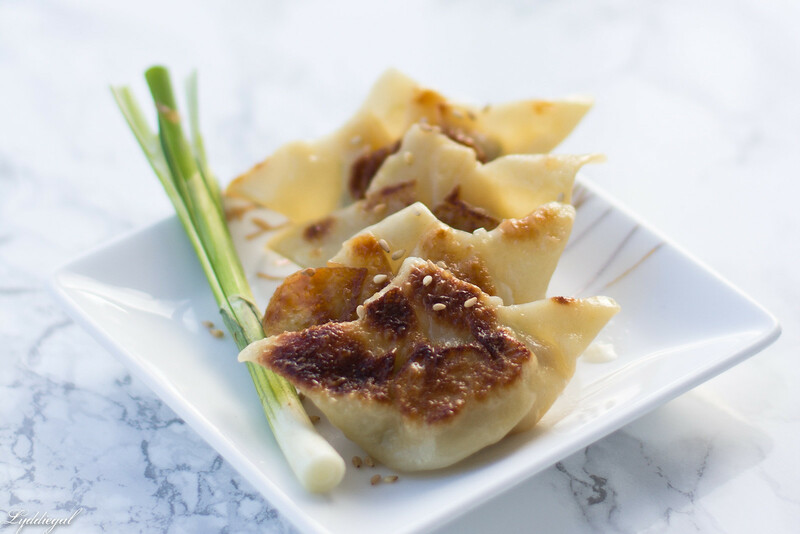 You should note that to cook these, you are going to need a pan with a proper fitting lid, and try to avoid non-stick, they are called potstickers after all - that golden crispy part is the best! Plus, once the water is added and they finish cooking with the steam, they become unstuck, like magic. 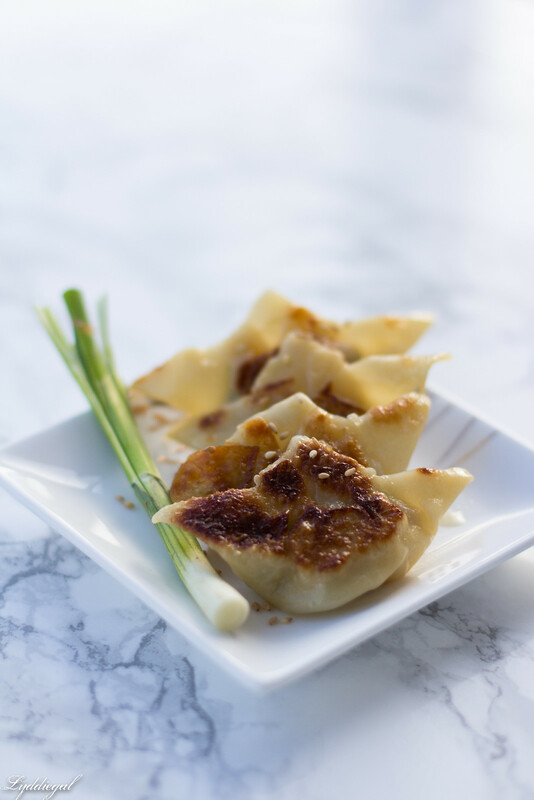 This recipe does make a ton, which is perfect for a party or if you love the idea of having leftover potstickers in the fridge (which I do). They can be served with a few fresh chopped chives, toasted sesame seeds, and of course tamari for dipping. Probably not super authentic, but easy potstickers made with ingredients from your regular grocery store. In a large mixing bowl, combine the ground chicken, shredded brussel sprouts, green onions, garlic, brown sugar, rice vinegar, ginger, and sesame oil. 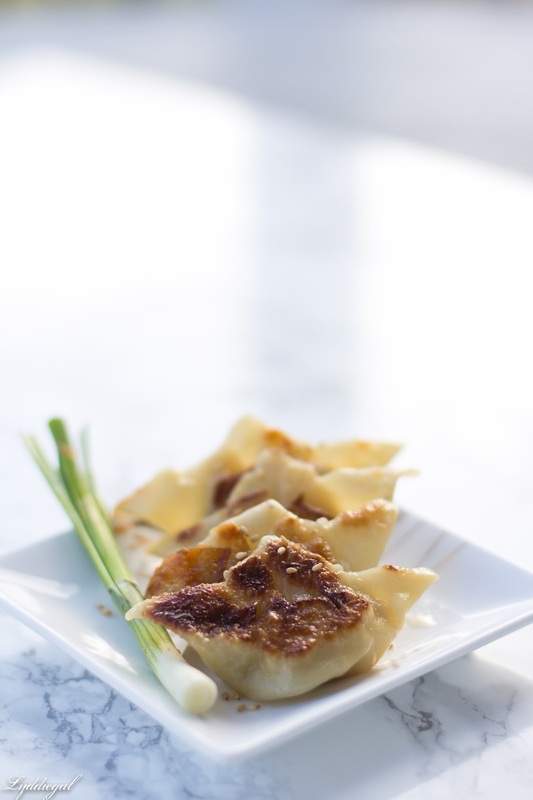 Using a small scoop or two teaspoons, place a small amount of filling in the center of a wonton wrapper. Wet a finger, and run it along the edge of the wrapper. The water acts as a glue and will seal the wrapper when you fold it in half. To cook them, heat a couple of tablespoons of olive oil in a pot with a lid. Put the potstickers in the pan in a single layer and fry for two to three minutes, until the bottoms are golden, and possibly stuck to the pot. With the lid ready, pour about a quarter cup of water into the pot, place the lid on, and lower the heat slightly. Cook for three more minutes. Ideally, at the end of the cook time, all the water should have evaporated, the potstickers will be completely cooked, and no longer stuck to the pot. Always check for doneness, and if needed adjust cook times and water quantity for the next batch to be cooked.